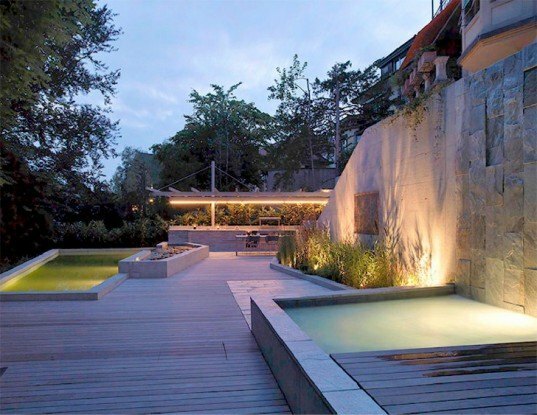 Situated in Zurich, Switzerland, this serene garden and biopool by Fletcher Studio is suspended on the edge of a steep hillside. By placing the garden on the hillside, the architects opened up views of the surrounding environment and made them an integral part of the garden. The existing hillside flora and additional plantings form a backdrop that encloses the garden, screening it from an adjacent street and enabling the area to function separately from the house. The garden is choreographed by an array of retaining walls that create a sequence of terraced outdoor “rooms”. These walls were conceived of as “sticks, falling from a hand” and are the dominant features on the site, suggesting a prior geology or archeology. In addition, the retaining walls hold the hillside structurally, making the residence secure on the steep slope. Perpendicular to the concrete walls are less permanent gabion basket walls that function as a modular retention system that may be moved or reused as the garden evolves. As new spaces and programs emerge, walls and terraces may be supplemented to expand the garden in the future. A natural biopool is the focus of the garden experience. An ecologically responsive solution that uses little energy, the biopool blends with the natural colors of the hillside flora. Wetland and bog plants thrive in the mini-wetlands, including cattails, iris, rushes, sedges and water lilies. These plants are a vital part of the natural water cleaning system by filtering the water and obtaining a natural mineral water quality. 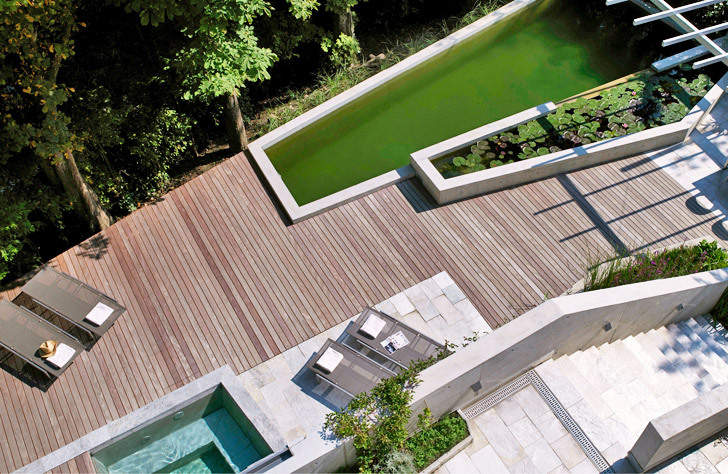 The plants, microbes and beneficial bacteria cleanse the water without the use of chemicals.